The institute serves as a key partner in research, scholarship and policy networks related to governance of the Great Lakes St. Lawrence River Basin. UBRI experts served as US co-lead for The Great Lakes Water Stewardship Project, an initiative undertaken under the auspices of the Transboundary Research University Network, for Water Stewardship, an international, transdisciplinary research network comprising 16 Canadian and United States institutions committed to innovative research, training, and engagement on issues affecting the Great Lakes-St. Lawrence River Basin. 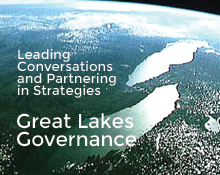 This project aimed to provide guidance with respect to major policies and programs focused on the Great Lakes-St. Lawrence River Basin, including the 2012 Great Lakes Water Quality Protocol and the Great Lakes Restoration Initiative, by suggesting areas of governance and policy reform and strategic research frameworks. The research goals were to develop an interdisciplinary, cross-sectoral understanding of the future of the Great Lakes-St. Lawrence River Basin; create translational results that integrate science and policy into practice; train the next generation of Great Lakes-St. Lawrence River Basin leaders; and recommend policy and governance reforms for socio-ecological sustainability of the Basin. In addition, UBRI served as US lead for a Social Sciences and Humanities Research Council grant that established a Great Lakes Policy Research Network. The Great Lakes Policy Research Network is a collaborative research partnership involving policy researchers and graduate students from eight universities in Canada and the United States. The goal of the network is to improve policy outcomes through the creation of new knowledge by engaging government, non-governmental, private sector, community organizations and other stakeholders in transboundary policy research projects.